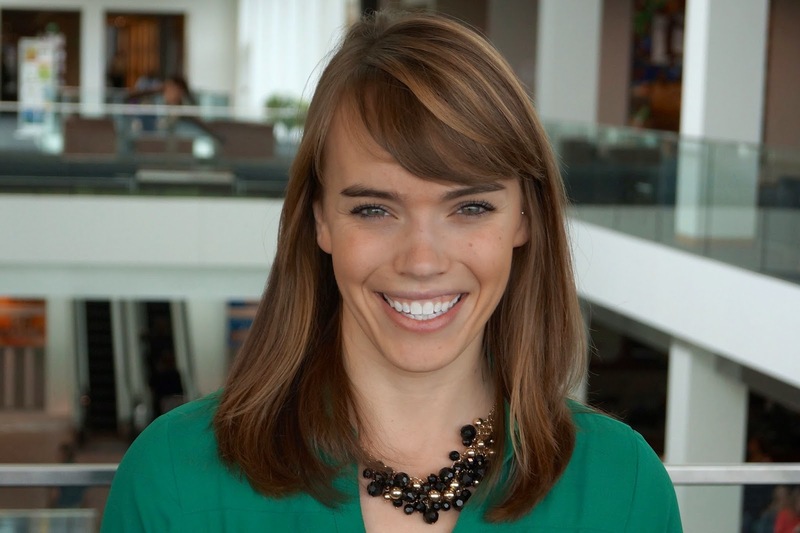 At this year's Minnesota Public Relations Society of America (PRSA) Classics Awards, Shannon Heine of General Mills was named the Young Professional of the Year. 1. Give a little background about yourself, including your hobbies, interests and education. I grew up in Maple Grove, Minn., and graduated from the University of Minnesota in 2010 with a degree in strategic communications and a minor in business management. I started at Carmichael Lynch Spong, now Spong, immediately after graduation as an intern and worked my way up to a senior associate. In March 2014, I accepted a position at General Mills as an external communications coordinator for the Global Communications team. My hobbies and interest: I love being active. Whether I’m working out, doing yoga, going for a walk with my husband and dogs, or even doing yard work – I am happy when I’m out and about. On the same note, I am a huge book worm. I enjoy reading the New York Times bestsellers every once in a while, but I can get completely lost in a Chic Lit book that allows my imagination to run wild. My other passion is cooking. I read a lot of recipes in my free time in an effort to find a recipe that is healthy and requires the least amount of ingredients (because I hate grocery shopping). Often times, I will combine multiple recipes into one to create my own concoction. 2. What made you initially fall in love with public relations? I love to write and lucky for me, writing is also a strength of mine. I also have a hunger for learning and understanding what is going on in the world around me. I went into the U of M as a pre-journalism major, but quickly learned that PR offered the best of several worlds for me: writing, news curating and strategy. 3. Touch on the key points of your professional PR career - various jobs, mentors, key responsibilities. I had several internships throughout college to help prepare me for starting my career at Wishes & More, the Ronald McDonald House Charities of the Upper Midwest and University of Minnesota Academic Health Center. I then started as an intern at Spong right after graduation and was eventually hired on. 4. Within the field of PR, what excites you about coming to work each day? I thrive off of the fast pace and ever-changing landscape of PR. I like to be challenged and know that each and every day will be slightly different than the last and the next. 5. Obviously we see that the field of PR is filled with younger professionals... if you had to give them three pieces of advice that would enable them to becoming successful PR professionals, what would they be? Today, getting a job almost always requires a reference -- so foster relationships with your professors, mentors, coworkers and peers, show them what you can do and then engage them to be your advocate as you seek job opportunities. Bite off more than you can chew because you will find a way to handle it and do it well – someone gave me that advice when I started as an intern at Spong and I will be forever grateful for that. It pushed me to raise my hand for any and every project, share my opinion in meetings and challenge myself to learn everything about my clients and the PR industry. 6. Where do you hope to see yourself in five years? Just in the months I have been at General Mills, I can certainly see myself here for the long run. It’s a great company to work for and offers a lot of opportunity for growth. 7. When did you join PRSA and what have you taken away from being a member of Minnesota PRSA? I was a member of PRSSA in college, which gave me an inside look at the PR industry and all of the career opportunities/paths within PR. I joined PRSA in 2012 and it has allowed me to continue to expand my network. I also participate on the PRSA Classics committee, which is always a fun event to be a part of. 8. Being in the field of PR for several years, do you see any upcoming trends for PR professionals? Throughout my short career so far, it’s been interesting to me to see how social media has changed the media landscape. No longer are reporters simply bylining objective news articles, they are now encouraged – if not required – to have a presence on social to drive conversation and share their opinions. As PR professionals, social media provides yet another opportunity to foster relationships and credibility with reporters – if done well, of course. Additionally, more than ever, PR is about telling a compelling and personal story for your brand or product. A good story will inform, involve and inspire your target audience to action. 9. 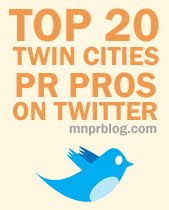 You were recently received the Young Professional Award from Minnesota PRSA. How did this make you feel? Why do you think you were chosen? When I learned I had won the Young Professional Award, I was so honored and touched that my colleagues would go to such lengths to recognize my work. I have been lucky enough to work with some of the best PR pros in the industry and they’ve given me invaluable opportunities to learn and grow. And, as Doug Spong likes to put it, I – like many PR pros – am an achievement addict and I am constantly pushing myself to exceed expectations in everything that I do. 10. Do you have a favorite quote or saying that relates to PR? 11. You recently joined General Mills after working for nearly four years at Spong. How would you compare and contrast the agency and corporate environments? While the workplace cultures between agency and corporate are quite different in many ways, in this industry some things will never change no matter where you are. Whether you're at an agency or working in an in-house PR team, the fast-paced, deadline-driven, storytelling, real-time culture of this industry remains the same.